CRYSTAL VIPER is back. After their last studio album in 2013 called Possession the band announced that they would be taking a break. The reason for the intermission was due to health issues of lead singer Marta Gabriel. Four years later and Marta is back and sounding more robust and boisterous than ever before. This tremendous news has fans eagerly awaiting their newest album Queen Of The Witches that releases on February 17th. Right from the first note of the beginning song "The Witch Is Back" you can feel Marta's passion for metal music. In some ways she reminds me of a female Ronnie James Dio. Her voice can be quite evil sounding , and can also belt out a piercing cry that gives you goose bumps. Further evidence of this comparison can be heard on "When The Sun Goes Down", a very superior ballad that will remind you of the old traditional metal songs of the eighties. Speaking of old school metal, CRYSTAL VIPER has some guest appearances within this album. Mantas from VENOM appears on "Flames And Blood" where he delivers a fast and furious guitar solo. Other artists showing up and lending support are Ross The Boss of MANOWAR on "Do Or Die", and Steve Bettney of SARACEN who shares lead vocals with Marta on "We Will Make It Last Forever". 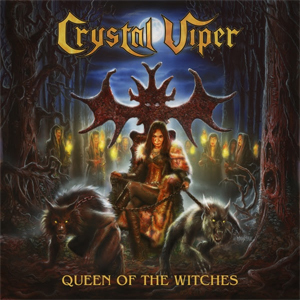 Queen Of The Witches is a great comeback album for CRYSTAL VIPER. Everything that you are looking for on a metal album is present. From gut wrenching guitar solos to outstanding riffs. The harmonies and lyrics will have you singing along at no time at all. With the slow rhythm pounding of Tomek “Golem' Danczak on drums your head will be bobbing back and forth. That my friends makes a very enjoyable album. Depending on what version you buy there are two different bonus tracks to receive. The digital and CD version has "See You In Hell" originally recorded by GRIM REAPER. The vinyl LP version will include EXCITER's classic hit "Long Live The Loud". Pick up your copy of Queen Of The Witches in the KNAC.COM More Store right HERE.